Add a regal look to your garden with the Panacea Arch Trellis with Finials. Crafted from steel rods, this item adds a distinguished touch to any area. A gentle arch forms the top of the piece, and three vertical rods create the inner support. These rods are topped with fleur-de-lis shaped finials for added interest. 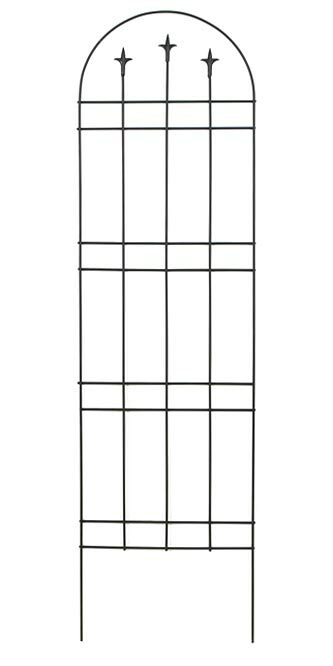 Eight horizontal rods intersect the trellis to form a loose grid, offering support for your growing plants. Two 10.5" long legs stake into the ground for a sturdy base. The black powder coated finish will offset your blooms, while the metal construction will withstand exposure to the elements. Enjoy a stately garden with the Arch Trellis with Finials.